Allendale is perfect for guests that enjoy walking downtown to Brevard and have the neighborhood feeling of living in Brevard. The home was built in 1943 and has arched doorways, plaster walls and hardwood floors. It is a classic American cape cod style home. The execution of furnishing this home has been done to make the home feel modern, light and bright. The uncluttered dining, living and kitchen areas will allow you to escape your everyday life and relax here. The four seasons sun porch is a perfect place to enjoy a glass of wine or evening cocktail with large windows and a mountain view, you will feel right at home. The owners have thought of everything and you will find new furniture, new quality linens and towels along with washing soaps provided. 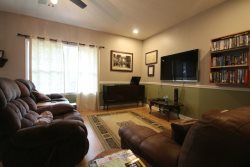 Allendale is new to the vacation rental market, so don't let the lack of reviews deter you from staying here, be one of the first to give this home a 5 star review and enjoy the introductory pricing while it lasts.